So here we have AWIC – A Week In Cards – the idea is to make and post a card the same day for one whole week. Phew! That is my addiction program, girls! With 6 more minutes go, here I post my first card :) If my midnight photography is miserable, I’ll re-post the pics alone tomorrow. When I saw this post on Paperlicious, I’ve always wanted to case it. That’s the main reason I bought this five petal punch. 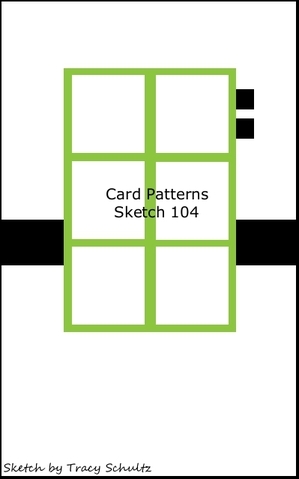 This card’s layout is inspired by this week’s Card Patterns Sketch 104. If you are wondering about the similarities, please look closely :o) The layout is REALLY inspired by this sketch. 5 Petal Punch from itsybitsy, butterfly punch from Venus traders, Pune. Paper from a DCWV stack I got years back from Joann. The pics are soo dull – I think I HAVE to post the pictures again tomorrow. Such a darling card...love the little blooms and butterflies...thanks for playing with us at Card Patterns! gorgeous CAS card! love the buttons! thanks for playing along with us at the Shoe! I love the elegance and simplicity of your card! Wonderful creation with the sketch! Thanks for playing with us at IDIC this week! Lovely card Jaya! !Simple and elegant. Wow this is just gorgeous, love love love the color combo n those cute flowers! I have that card by Joan in my saved files too!! this is so CAS and pretty! love the font on the stamp! this is simple but gorgeous card Jaya! !You ppl rock!! Very pretty card! Love the little flowers... and great great AWIC Edition 1 :) Loving it! 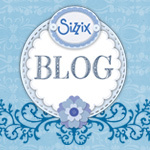 its simple but really nice looking card..
congrats on ur success of this card blog hop.. wow!!! This is so KISS & chic!